It is with great pride that I bring you this newsletter, containing stories of Nordic Walkers who have completed notable challenges. These achievements are remarkable as they are attributed to people who are in "The Third Age". Defined as the "time-span between retirement and the beginning of age-imposed limitations", these people are simply hurdling the limitations barrier. It is increasingly obvious that the typical expectations of decrepitude with aging are being delayed by physical, mental and social activities. Third-agers have more time to follow interests that were put on hold during their career-building and family-rearing middle years. Returning to study, travelling, new relationships and physical activitites, are keenly pursued, as the possibilities for self-fulfillment, in those areas, become achievable due to increased time availability. You may be interested to read the following article on "The Golden Years of Adulthood" by Dr. Stephen Barnes, San Diego State University. The Camino de Santiago also known as the Way of St. James, is the name of the pilgrimage routes to the shrine of the apostle St. James in the Cathedral of Santiago de Compostela, in northwestern Spain. Legend holds that St. James&apos;s remains were carried by boat from Jerusalem, where he was buried on what is now the city of Santiago de Compostela. The Way can take one of dozens of pilgrimage routes. Traditionally, as with most pilgrimages, the Way of St. James began at one&apos;s home and ended at the pilgrimage site. Today, the route attracts a growing number of modern-day pilgrims from around the globe. Simone is one such pilgrim. In 2013, she cycled the most popular route, which is the &apos;Camino Frances&apos; (800km) starting from St Jean-Pied-de-Port in France. Then in 2015, she cycled the &apos;Camino Portugues&apos; from Lisbon to Santiago (580km). 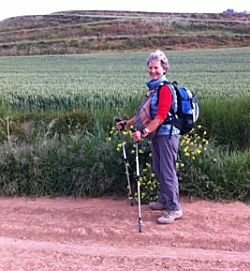 Simone wasn&apos;t ready to go home, so started walking on 18 May 2015 from Roncevalles, on the Spanish side of the Pyrenees to Santiago de Compostela, arriving on 19 July, including visits to each of the following cities: San Sebastián, Bilbao, Pamplona, Burgos, Leon, Astorga, Seville, Granada, Córdoba, Madrid and Leon. These "Health-Active" Nordic Walkers have been walking together for nearly one year. As they have built their fitness and friendships, they are now relishing the opportunity to challenge themselves by entering into events. They are pictured here, after completeing either the 5km or 10km distance at the Bombay Settlers event. 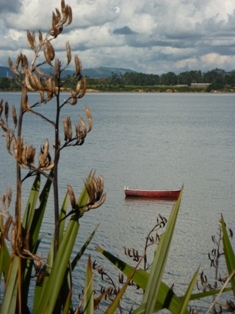 Previously, they have completed the "Nordic Kiwi" 7km distance and part of the "5 Volcanoes" walk. Some of the group do suffer from health and mobility issues, but through regular Nordic Walking, they are now testament to the benefits of regular exercise. By the way, the average age of the group is ... 70! "A journey of one thousand miles begins with a single step." This well known proverb is attributed to the Chinese philosopher, Lao Tzu. It indicates that great things are achieved from humble beginnings - that even the longest and most difficult ventures have a starting point. Many people don't enjoy physical exercise ... until they do a little. The thought of doing any endurance exercise automatically stops their consideration. Yet, when the body becomes accustomed to the training response, magical achievements occur. 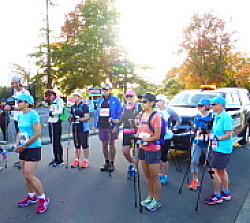 Recently, a team of dedicated Nordic Walkers were successful in completing the 2016 Rotorua marathon. The marathon distance is 42.2kms and to achieve this goal, the squad followed a four month training programme. In the beginning, some of the first-timers weren't sure how they would cope. However, as the training progressed, their confidence and fitness improved. While each individual's journey was their own, the squad bonded together towards the collective goal. Obviously, the training had to focus on long distance walking. It also included a mixture of speed, technique and hill strength sessions. During some weeks, cummulative sessions were planned, designed to train the body when fatigued and to accommodate the limited training time available to squad members. Focus was also directed to implementing different nutritional guidelines. All of the squad completed the marathon, posting times much quicker than expected. As one squad member commented "I vowed never to do a marathon, but here I am!" 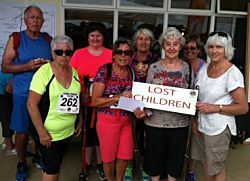 Their average age: 62years ... and their journey took 1105 kilometers to achieve. For those of you using EXEL or MtoS (Mountain to Sea) Nordic Walking poles, this is a reminder to check that your are correctly placing your hands into the straps. The entire hand and fingers must go through the strap, with the webbing under your palm. It is incorrect to have part of the webbing between your thumb and index finger. As seen from the photos, the hand, thumb and fingers are placed through the straps.